Health, well-being and fun hang out together at La Torre Resort's Pedalling Adventure. Now with 04 exciting routes among so many other surprises that you will find when facing this challenge. 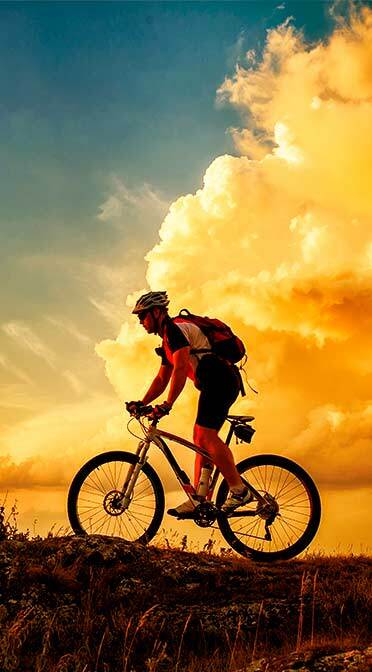 This experience includes: Transportation to the venue; bicycles suitable for mountain biking; individual insurance; complete structure with snack, toilets, guides, mechanic, first aid and stretching before and after activity. The journey begins along the beach discovering Muta's Cove passing through Ponta Grande to the dirt road that it will give access to Jaqueira's Reserve, which has 827 hectares of native forest. The hollows scattered in this area are still in their original format and refer to distant epochs, the Indians receive visitors dressed and with their bodys painted for the dances and rituals presentations. Displacement to the ferry by car. After crossing Buranhem's River, stretching and itinerary's presentation. We will follow through Apaga Fogo Beach, Araçaipe, Pescadores, Mucugê, Parracho to the Pitinga's Beach with its coral reefs where we will stop for hydration, snack and a delicious sea bath. We are going to pass by Mucugê Street passing through many shops and restaurants that make this the most charming street in Brazil until we reach Nossa Senhora D'Ajuda Church dating from 1550 with its beautiful view behind the church. Route 3 - Pedalling through Coroa Vermelha / Muta / Ponta Grande with kayak or Stand Up Paddle. Displacement to the Beach for stretching and itinerary's presentation. We will head to Coroa Vermelha and return to Ponta Grande passing through all of Muta's cove, framed by coconut trees. Uncrowded, with warm, calm and transparent waters, is perfect for practicing nautical sports. We will changes the bycicles by kayaks. Meeting at 08h00 at the La Torre's Reception. Displacement by car to the Pataxo Square along with Rio Buranhem's ferry for stretching and itinerary' presentation. We start our cycle route through the Passarela do Alcool's sidewalk discovering the colonial style house and appreciating the amazing sandstone formation that separates the river from the sea. Stop for photos at beginning of the sidewalk and Inaia Square along with the Municipal Pier. We follow the bike path to the Discovery Memorial. Find the Guest Experience and schedule your Pedalling Adventure! This Experience can be acquired by credit card and the groups must have a minimum of 02 people and maximum of 08. Daily activities, 15 years minimum age. Amazing trails in the middle of an environmental reserve where you will live an exciting challange facing hillsides, bridges, waterfalls and many surprises. Record this moment and share with your friends the treasure of living this experience! Unlimited vacancies. See the Guest Experience team for prices, tour dates and payment terms.